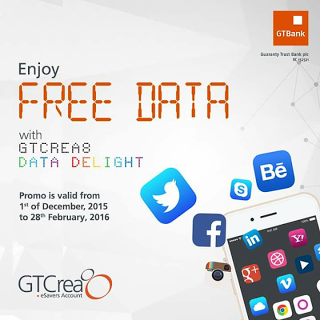 This is to all who utilizes GtCrea8 account… GTB is not left in remunerating her clients this season. As indicated by what GTBank stated, Use your GTCrea8 naira MasterCard to make payments on POS terminals no less than 3 times, and get 1GB of data free to browse your favourite sites! Meaning, when you utilize your GTcrea8 ATM card to pay for any services via POS 3 times, you'll get 1GB free data and you'll be notified by means of sms. Legitimate from 1 DEC 2015 to Feb 28 2016.